I am indebted to Dr. Richard Leblanc of York University for the action headings used in this blog. The blog uses headings developed by Dr. Leblanc for his blog: “What a Board Expects from Management, and What Management Expects from a Board, January 27, 2013, York University Governance Gateway Blog. (rleblanc.aps01.yorku.ca) For reading simplicity, Dr. Leblanc’s specific quotations, which can apply to either FP or NFP boards, are noted in italics. The nonprofit board should speak with one voice and not send mixed messages to management and staff. Nonprofit boards are usually composed of people with widely diverse backgrounds, as compared with for-profit ones. For example, one nonprofit bard, with which I was affiliated, was split, because of its diversity as to the status of a newly hired chief executive who had encountered problems managing the staff. The board divided between two factions. One that wanted to give him more time to heal the situation, and the other that wanted an immediate dismissal. Dismissal was the final outcome, but the schism that developed between the board and staff remained for decades. Also the hierarchy of nonprofit organizations is relatively flat, operating staff personnel may only be two or three levels below the board. As a result, the communications between board and staff becomes more important than in multilayered organizations. 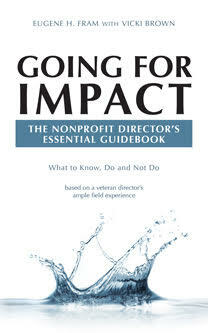 Since most nonprofit directors are independent directors, often not directly associated with the field and mission of the nonprofit organization, management expects directors to invest the time to understand the (field) more fully… Otherwise, these directors will be of limited use to management strategically nor (will they be creditable directors). (Nonprofit) management gets frustrated by dated, legacy directors who have outlived their usefulness. Some get around the challenge by establishing an honorary board, one without voting power. However, all voting nonprofit directors need to “drill down” in the organization to become acquainted with the contribution of key staff. The use of “big data” analytics will enable board members to “drill down” more easily.